After tomatoes, green beans might just be the most popular home vegetable garden crop. And for good reason! They’re easy to grow, super prolific, and quite tasty. Every year we grow green beans for eating fresh and for preserving. Now, green beans also have other names. Some people call them snap beans because they make a snap noise when you break them. Some people call them string beans, even when it’s a stringless variety. Green beans also come in colors other than green. 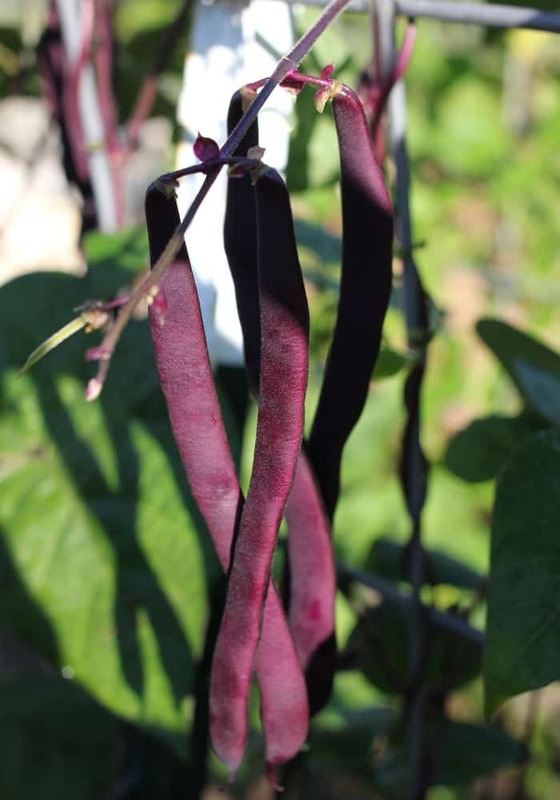 One of our favorite varieties is purple podded beans. In addition to green and purple, green beans also come in yellow and red. I like to grow enough green beans to eat fresh and preserve some for the year. I keep a set of worksheets on what I’ve grown each year so I can look back and plan how many plants I need for the coming year. If you’d like to get a set of these worksheets emailed to you, just fill out the form below. There are many varieties of green beans and we’ve grown most of the major ones. We’ve found that all of them have their positives and negatives when it comes to growing, harvesting, and eating. 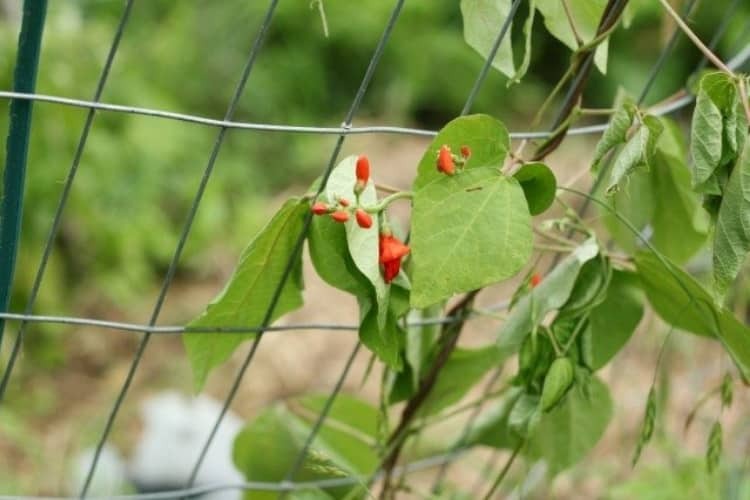 Pole beans are beans that grow on a vine instead of a bush and need the support of a trellis or fence. This is my favorite type of bean to grow because it makes harvesting easier. We have a variety of trellises that all were cost effective and will last for years. We have used our tomato cages in the past and they work fine but really weren’t tall enough. These cages are metal cages that are used to support 250 gallon totes. We have a trellis made out of an old futon frame and a trellis made from old iron bars off our windows. We have a few old table frames from folding tables that we put up along the fence to give height to the fence. Lastly, we used t-posts and cattle panels to create some arches in between some of our garden beds. This is my favorite trellis for pole beans because it gives a lot of height for the vines to grow but it’s not too high to still harvest from like the table frames are. Pole beans are wonderful for small spaces since they grow vertically and don’t take up much room. You can add a trellis at the end of garden row or bed and in just a couple of square feet grow 8 pole bean plants. I really like using the space between my garden beds and an arch trellis because it always makes me feel like I’m using free space. Growing pole beans on a trellis also means that the beans stay up off the ground and stay cleaner. It also means that water does’t splash all over them when I’m watering and that reduces the risk of powdery mildew developing on them. Some people don’t like having to use a trellis either because they don’t want the expense or are worried about not being tall enough to harvest all the beans. So, that’s something to consider. Pole beans will continue to produce beans all summer long and until the first frost. However, they might pause production when temperature rise into the high 90s. My favorite pole bean varieties are emperite, purple podded. These are both stringless when the pods are immature and both are prolific. Bush beans are probably the most common green bean variety that people grow. As the name suggests they grow on a small bush. Bush beans also tend to put one large crop and then production slows down. This is great for someone who is canning and wants most of the beans ready at one time. Bush beans usually produce quicker than pole beans but they don’t usually produce as long. When I grow a fall crop of green beans I grow bush beans for this reason. Harvesting bush beans takes a bit more time than harvesting pole beans and you have to get ground level since the bush bean plant is usually not higher than knee high. This is a great job for children. Bush beans run the risk of getting dirt and water on them when you’re watering so you’ll want to be extra careful to only water the ground and not the plant. My favorite bush bean varieties are contender and yellow wax beans. Both are prolific and stringless. Runner beans are a perennial vegetable that is often grown as an ornamental and looks great in edible landscaping. Runner beans are a pole bean and need to be grown on a trellis. Scarlet runner beans are probably the most popular runner bean. Scarlet runner beans are cold hardy to zone 4 and will benefit from a heavy mulching for overwintering. The immature pods can be eaten as green beans and the mature pods can be shelled and used as dry beans. 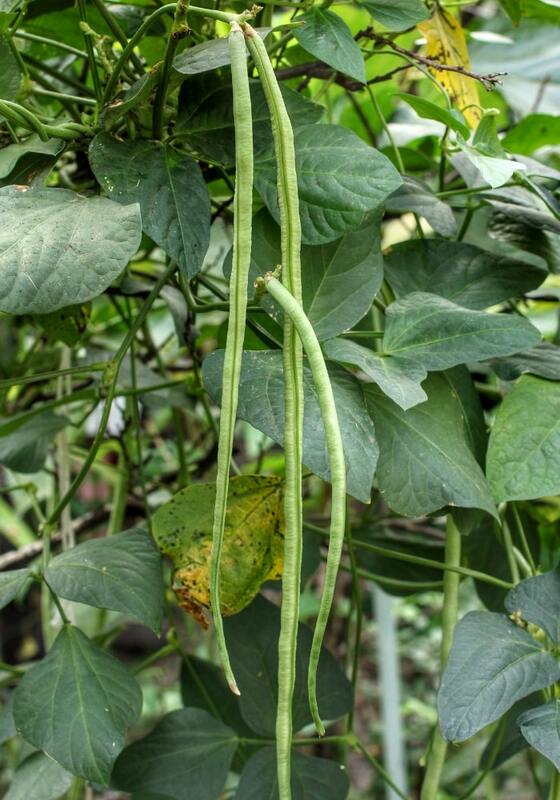 Asian beans are long which is why they are also called yardlong beans but they aren’t really a yard long. They are more like half a yard long. The first time I showed my grandson one he said, “Whoa, that’s long worm!” Why, yes, the green ones do look like very long worms. Asian beans can be red or green and are more cylindrical shape than other green beans. I think they’re more tasty raw than either pole beans or bush beans. One of the really great things about yard long beans is that they can withstand higher temperatures than other beans can. I grow a few plants every summer to fill in the gap left when our other beans take a midsummer break. This is part of my lazy way to succession plant. We prefer to eat Asian beans fresh and not preserve them but they can be preserved just like other green beans. Other names for Asian beans are Japanese long beans, Chinese long beans, asparagus beans, and noodle bean. Beans are pretty easy to grow and as long as you water them regularly by watering the soil and not the plant they should do well. Beans can be direct seeded in the garden after your average last frost date. Beans need a soil temperature of at least 60°F to germinate. You can start them indoors about 4 weeks before your average last frost date and then plant them outside once the danger of frost is over. You can soak the beans in water over night before planting to speed up germination. Beans usually take 10-14 days to germinate but I’ve seen them germinate in as few as 7 before. It just depends on the soil temperature and moisture. Plant beans 4-6″ apart. This goes for all pole type beans and bush beans. The bush beans need some support as they grow and having the plants no farther apart than 6″ lets them lean on each other for support. Beans are natural nitrogen fixers for soil which helps build healthy soil. Instead of pulling the plant at the end of the season, I like to cut it at the soil line and leave the roots in the soil. As they decompose they’ll nourish the soil. To save green bean seeds to plant the next year, just let some pods mature and dry out on the vine. Then pick the pods, open them, an take out the seeds. If you don’t already have seeds, you can get several varieties from MIGardener Seed Company. MIGardener only sells heirloom seeds and for only 99 cents a packet. You can get a 10% discount on your entire order by using this link – no code needed. I don’t do a lot of intentional companion planting but I do a lot of interplanting and think diversity in planting is super important for a healthy garden. However, I do try to be mindful of plants that just don’t play well together. 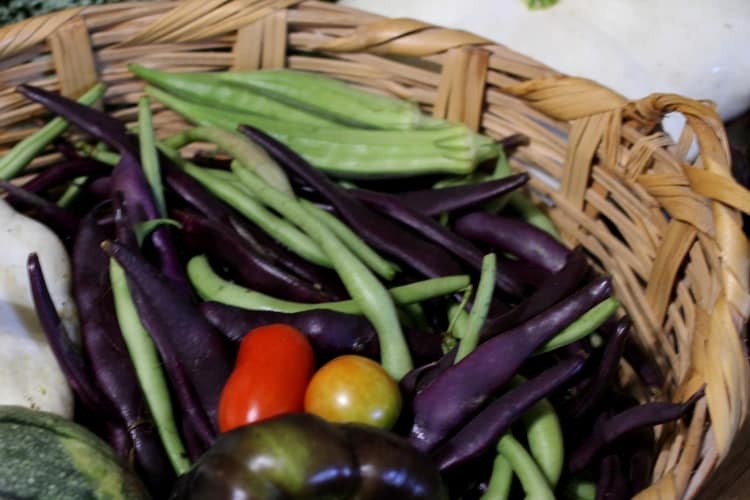 Plants that shouldn’t be grown with beans…. These are great guidelines but don’t get too hung up on planting everything just so. You can drive yourself crazy making sure you companion plant everything. In fact, I’ve grown pole beans on the walkway side of the onion raised bed and they all did just fine. Sometimes, that’s the only place left to plant them and so that’s where they go. Most of the problems with beans can be prevented or at least decreased by rotating crops on a 3 year basis (esp. if you have had rust) and not watering the leaves. Powdery mildew – is a white mildew that will attack the leaves of beans, squash, melons and cucumbers. It is caused by too much moisture on the leaves and is spread by bugs. We try to cut off infected leaves and burn them. Occasionally we’ll dust the leaves with wood ash to change the ph balance and that also helps manage the powdery mildew. Rust -causes brown, withering leaves and can lead to a loss of bean crops. A fungus causes this ailment, and it’s spread when spores from infected crops are carried along the wind and land on healthy plants. We have never experienced this but we have some friends in our area who struggle with this. Remove any infected plant sections as soon as you notice this and burn them. Bean Beetle – This looks like a big orange lady bug with an orange (not black) head. Here’s a great article on them. We pick them off and squish them. The rule is “If it’s a lady bug that doesn’t have a black head it’s bad.” If you decide to use a pesticide remember that even pesticides labeled for organic use cannot differentiate between good bugs and pests, so use sparingly. Harvest when the pod are small, be diligent when looking – they can easily hid under the leaves. 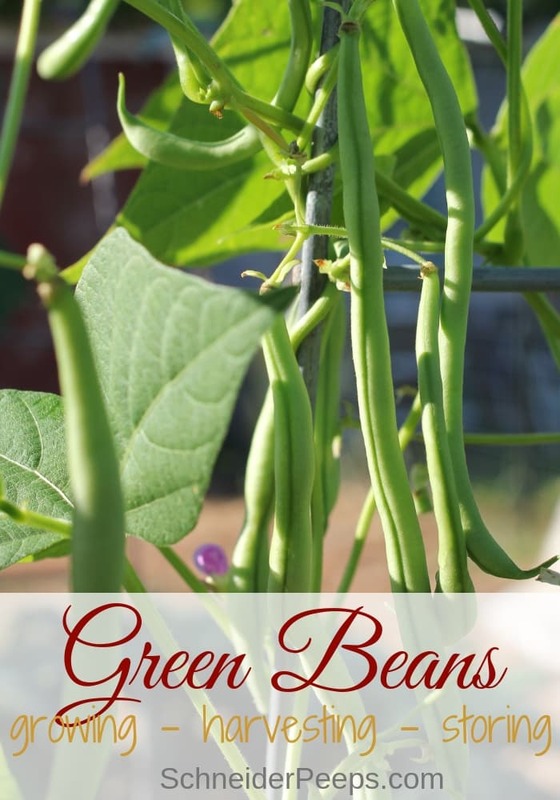 Regular pole and bush beans are best picked when they are 4-6″ long. Pick Asian beans when they are 12-18″ long. If we miss beans and they get larger we just leave them on the vine and let them mature then save the seeds for the next year. Green beans can be canned, fermented, frozen and dehydrated depending on how you want to use them in the future. They can be stored for up to a week the refrigerator. When I need to store green beans in the refrigerator I leave them unwashed and put them in a bowl covered with a damp towel. 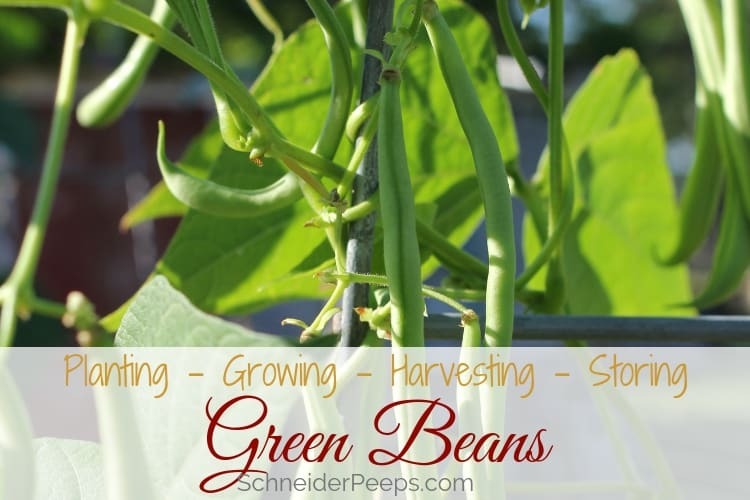 Do you grow green beans? What are your favorite varieties and best tips?